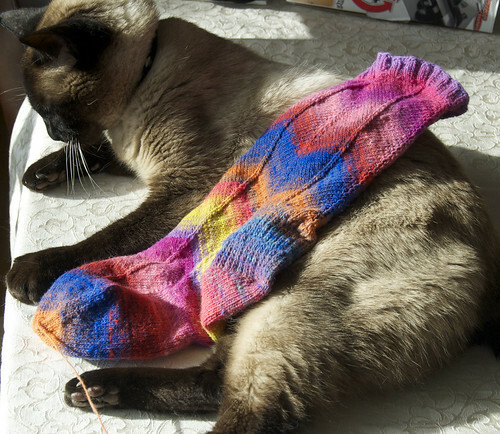 I finished my retina-immolating Jaywalker sock a few weeks ago – I’ve just been very slow to update things around here. For like two years. Anyway, this sock is not going to be getting a mate any time soon. I had a lot of fun knitting it and I personally like the, shall we say, whimsical colorway, but I’ve put it up to a vote of my knitting peers and the consensus is that these colors only belong on a six-year old girl who is running away to join the circus. Some people went so far as to suggest that the six-year old would probably only wind up wearing these colors if she was subsequently vomited upon by a queasy clown. This entry was posted on Saturday, January 22nd, 2011 at 10:22 pm	and is filed under Uncategorized. You can follow any responses to this entry through the RSS 2.0 feed. Both comments and pings are currently closed. Hey, that looks like what I imagine the inside of my stomach to look like now that I’ve eaten about a pound of Mike & Ike candies. Pass the Maalox. Aw, come on – we all want to see you at Rhinebeck wearing a kilt and those socks! I agree………..think they’d look swell with yer kilt! Life is too short to wear white socks. I’m going to go against what appears to be the general consensus here — as much as I love pink, that colorway is a bit…. ummmm….. much….. Apparently I am six. And I should join the circus. The blue lends a nice contrast. Cute kitty. Why the h… not? But long pants might be advisable so only flashes show. Skip the kilt with these. I love your model! Well, March is for Making Mates, you know, and I like it! It’s bright and cheerful. I’d totally wear a pair of socks like that. On second thought, Hell No. I’d so wear those. With shorts, no less. I with Jess on this one. I would wear the hell out of those socks.